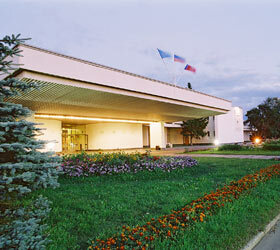 The Suzdal Hotel is a part of the Suzdal Tourist Centre Complex. The hotel can accommodate up to 350 guests at a time in rooms of Standard, Studio, Suite and Apartment categories. A Standard room includes - double-bed or separate beds, TV and fridge, bathroom with shower cubicle or bathtub. Placing of extra beds and baby cribs is also available. All guests are offered complimentary breakfast in the morning, a visit to the gym and swimming pool. The Suzdal Hotel welcomes guests to try Russian and European dishes at the Suzdal and Day and Night restaurants and pay a visit to the lobby bar. Also, guests can have a relaxing experience at the day spa. For hosting large-scale business and mass events the hotel provides versatile conference halls, and cinema and concert hall.